Quilter's Daily Deal | The web's best quilt sale - a new quilt deal every day! Limit of 1 per customer at this price. Limited quantities available at this price, get it before it's gone! left to buy, or until we're sold out! This weather has put an extra SPRING in our step this season and we can’t wait for many of you to come visit us this year! This week we’ll be giving you a peek into a different one of our themed fabric shops every day. Today we’re featuring the Backing & Trims Shop, filled to the brim with ribbons, zippers, rick rack, and binding. All these wonderful little additions make your projects really pop. And if you’ve never used backing fabric for a quilt you’ll be surprised at all the options you have for backing your quilt with no seams! Today’s Deal is a fan favorite. This stabilizer sews like butter and makes formerly fidgety projects a pleasure to sew. 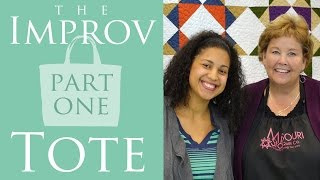 You have got to watch Jenny and Vanessa from Crafty Gemini use this amazing stuff in their Improv Tote tutorial. When this tutorial came out, everywhere sold out of this incredible foam, so grab it while you can! So, in summary, the deal for today is a In-R-Form Plus Double Sided Fusible Foam Stabilizer by Bosal Foam & Fiber for Bosal Foam & Fiber for only $4.65 - that's 62% OFF! Good news! If you are logged in when you buy this deal, you will receive 1% back in Quilter's Cash*. Any other products you add to your cart will get you 3% back in Quilter's Cash (and maybe more if they have bonus points!) Click here for details on the best Quilting Rewards Program on the web - Quilter's Cash!